During these frigid winter months, septic system owners often think they’re off the hook for maintaining their systems. A lot of people assume we don’t service septic systems in the winter, and they are often surprised when we tell them winter is one of the most important times throughout the year to make sure you’re keeping up with septic service appointments. One big reason for that relates to how Fats, Oils, and Grease (FOGs) respond to cold weather. Why are FOGs a bigger issue for your septic system in winter? We have talked about the effect of FOGs on your septic system before and have discussed ways to help avoid them entering your system. But in the winter when temperatures dip into the single digits (and lower! ), FOGs are especially burdensome as they are prone to not only solidifying, but freezing in your pipes and septic system. FOGs accumulate in your pipes faster in cold weather, solidifying and making trouble for your system. To get a sense for how extreme a problem FOGs pose for your pipes and septic system in the winter, consider the various stages of butter in your kitchen. Sitting out at room temperature, which is somewhere between 68°F and 75°F, butter is easily spreadable. It’s not a liquid, but it’s still pretty soft. That same stick of butter taken right out of the refrigerator, which most people set between 32°F and 37°F, is not spreadable, but can still be cut with a knife. That same stick of butter taken directly from the freezer, which is often kept between 0°F and 3°F, is as hard as a rock and impossible to cut with a knife. FOGs in your septic system act much the same way. If they go down your pipes in liquid form, they will solidify, float to the surface, and freeze, eventually causing a blockage in your pipes or septic system that could lead to effluent backing up into your home over overflowing from your tank. How do you avoid problems with FOGs in the winter? First, follow our advice for disposing of FOGs in your home. The fewer FOGs that get into your pipes, the better. 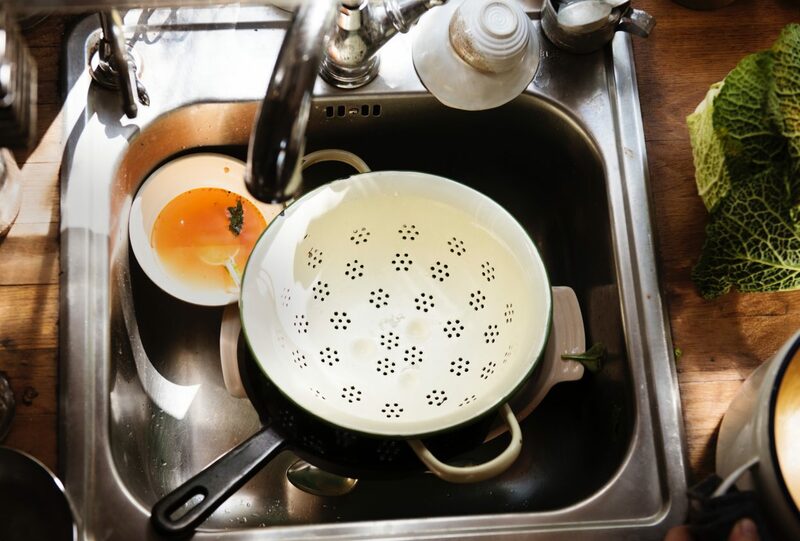 While it would be ideal, avoiding any FOGs getting into your system is not really possible, especially in homes where a garbage disposal is used (yet another reason we don’t recommend garbage disposals for homes with septic systems). Fats and oils are components of nearly every food you grind up in a garbage disposal. So along with the extra food solids you’re introducing into your septic system, you’re also adding FOGs that will be inclined to turn solid as a rock when the temperatures fall. Most importantly, be sure to keep up with your septic service appointments. Ridding your system of the food solids and extra FOGs that accumulate more easily during the winter months will help you avoid a septic system with frozen, clogged pipes or worse. Maintenance helps remove FOGs to keep your system running smoothly. Have you had your septic system serviced yet this winter? If not, it’s time to give us a call!